Product code: ES8357 Categories: Art Deco, Art Deco Rings & Art Deco Engagement Rings. Here is an Art Deco 18ct and platinum diamond wedding band dating from the 1920’s that looks so good on when worn on its own, and perfect when worn alongside a wedding ring, and regardless of how it is worn, there is little doubt that it will always be admired. So elegantly hand made, the five early brilliant cut diamonds come together to total 0.85 carats and looking close you will note that not only does the band taper down in width, but also the diamonds with the largest one being in the centre and the smallest at each end. In the centre the band measures 4.4mm wide and from one end diamond across to the other, this distance measures 18.8mm across. And typical of fine quality hand made pieces of this era, even the sides of the ring have been delightfully hand engraved adding that extra element of charm and character. No matter how you choose to wear this ring, there is one thing for certain – it will always look and feel right no matter where or when it is worn. Tags: Art Deco Diamond Ring, Art Deco wedding band. 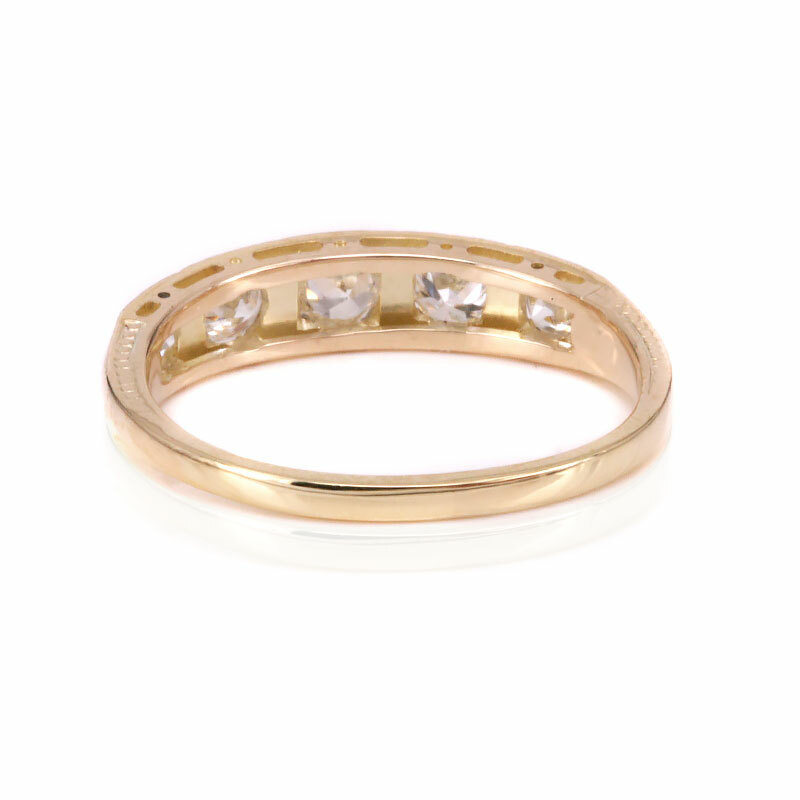 This Art Deco diamond wedding band looks perfect on its own or alongside a wedding ring. Hand made in 18 carat yellow gold and platinum, the sides of the ring have been beautifully hand engraved.